Effort. Tears. Laughter. Endorphine. Overwhelming emotions when You, along with runners from almost 100 different countries, with a will as strong as yours, conquer the streets of Stockholm. ASICS Stockholm Marathon takes place right in the heart of Sweden’s capital to the sound of thousands of leaping feet, the song of gulls and the cheering of the spectators along the streets. A running adventure through one of the world’s most beautiful capitals. Depending on when you sign up during the year, the price varies. You will earn on signing up early. See our price matrix for more information on the different levels up to 2019. E-newsletter to keep you well informed. Opportunities to test-run the course. Zeta pasta party the day before the race. Marathon Expo in the same location as the number bib collection. Massage and foot treatment service. Pacemakers help you run your dream time. 17 refreshment stations with water and sports drinks. Bananas, energy bars, coffee, clear broth, energy tablets, soft drinks and salted gherkins – at a number of the refreshment stations. Tracking service for runenrs who carry their smart phones (GPS) – fun for family and friends to follow your progress. Massage at a number of stations. Foot treatment at every water station. Medical service at start, finish and all refreshment stations. Live entertainment – music, announcers and activities along the course. Taxis which will take you to finish if you are forced to drop out. Sports drink bottle with water. Exclusive medal – different Stockholm motif every year. Goodie bag containing soft drink, recovery drink, sweet bun and more. Energy replacement in the form of hot dog, beer, coffee and sweet buns. Live online results service including split times. The race starts in two groups, at 12:00 and 12:10, from Lidingövägen, outside the Clock Tower of Stockholm Olympic Stadium. In accordance with our permit from the police authorities, the maximum running time is 6 hours. The course is 42,195 metres long, and has been measured in accordance with Swedish Athletics Federation and IAAF rules. The measurement was carried out on 25 April 2017 by Hugh Jones, AIMS course measurer from Great Britain and Mikael Hill from Stockholm. Each kilometre will be clearly indicated with a sign. For a more detailed description of the course click here. ASICS Stockholm Marathon includes the following age categories for men, women and people with other gender identity: Open (born 1980–2001), 40 plus (born 1975–79), 45 plus (born 1970–74), 50 plus (born 1965–69), 55 plus (born 1960–64), 60 plus (born 1955 – 59), 65 plus (born 1950-1954), 70 plus (1945-1949), 75 plus (1940-1944), 80 plus (1939 or earlier). Minimum age is 18 years (born 2001 or earlier). 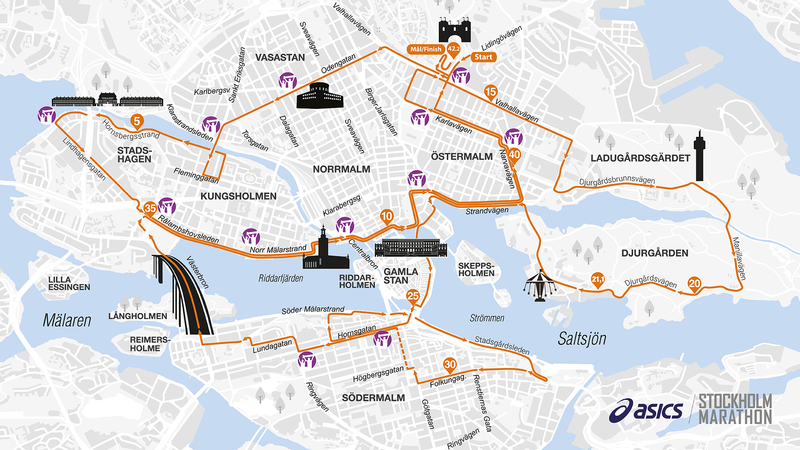 Participation on or with any device on wheels is not permitted in ASICS Stockholm Marathon (with the exception of authorised wheelchairs which are registered in the wheelchair category). This includes, for example, hand cycles, cycles, strollers, baby joggers, joelettes, roller skates, roller skis, inline skates and skateboards. The ASICS Stockholm Marathon is conducted in accordance with the rules laid down by the Swedish Athletic Federation and by the IAAF (International Association of Athletics Federations). 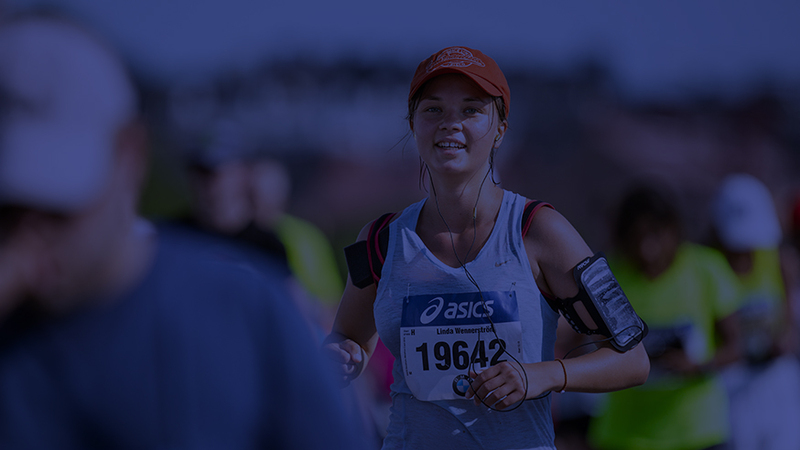 If you have any questions before ASICS Stockholm Marathon, please contact us by phone +46 8 545 664 40 (weekdays 09:00-12:00 and 13:00-16:30) or email [email protected].